The 2018 Football season will look different to all who enter the gates of Dragon Stadium this year as a multi-million dollar renovation draws closer to completion. Upon entering the stadium, the eyes of the fans will be immediately drawn to the new artificial turf that has been been put down to replace the natural grass surface that has seen many years of tackles and touchdowns. 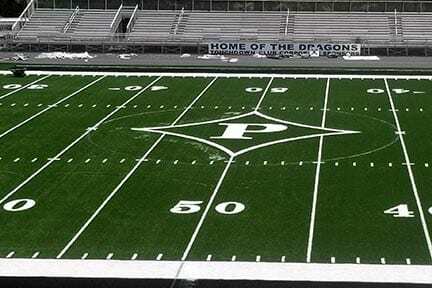 As the history of the old field remains in the hearts of Dragons before, a new era of history will begin on Friday May 18, 2018 as the Tigers of Dawson Co. will come in as the first opponent on the new turf and will end the 2018 Spring practice session for the Dragons. 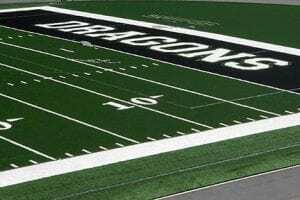 As exciting as it will be to see the Dragons take the field on Friday, it is just as exciting to know what actually goes into creating a masterpiece. 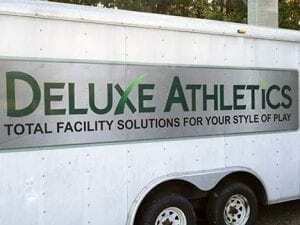 The new turf is being completed by Deluxe Athletics. Their name might not be known but you will definitely recognize their work. 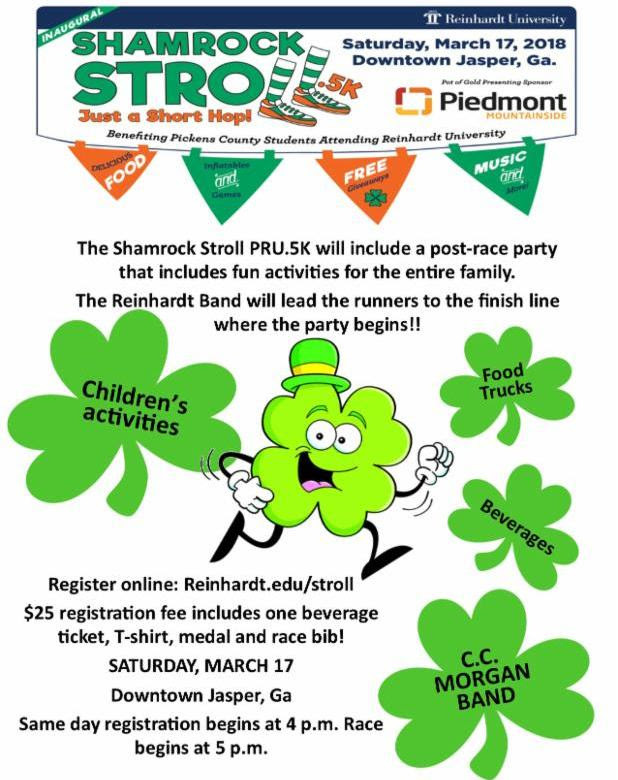 Probably the most recognized on their resume is Mercedes Benz Stadium in Atlanta. As the home of the Falcons and Atlanta United, the turf is obviously durable and in Dragons Stadium it will see both football and soccer action for years to come. The process of installing a surface such as this is fairly complex. After the turf is unloaded from the trucks, it is placed on the ground and rolled into position. Each roll is attached together by a rolling sewing machine and the meticulous job of putting the hash marks, numbers and logos begin. Every hash is individually cut out of the green turf and white strips are placed using a rolling machine that heats industrial strength hot glue to secure them. 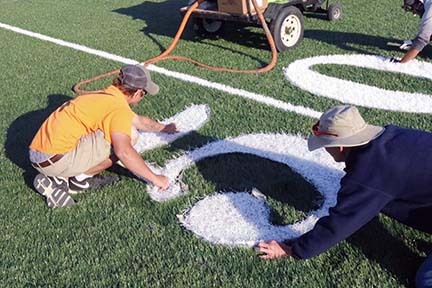 This process also occurs for the numbers, the logo in the center of the field and also for the end zone logos. Once this is complete the turf is swept with a street sweeper to prepare the surface for the sand and rubber pellets that lie deep within the grains of the artificial grass. As the sand starts going in, it is monitored to remain at a specific depth and the packed with a commercial roller to ensure firmness and consistency of the playing surface. Following the sand, the crews bring out the rubber pellets to spread over the field. After completion of layer one of pellets, a second layer of sand and pellets are applied and then swept again. In the final process in completing the field a new technological product will be used. Cool Play is a highly advanced pellet that has a surface temp of 35 degrees cooler than traditional pellets used in artificial surfaces. 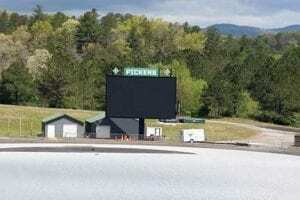 Also new to the stadium is a state of the art 32 feet high definition Jumbo Tron video board. This will allow player bios and game highlights to stream throughout the game while still functioning as a normal scoreboard. Track and Field for Pickens will benefit from the renovation as well with a new track surface being installed. 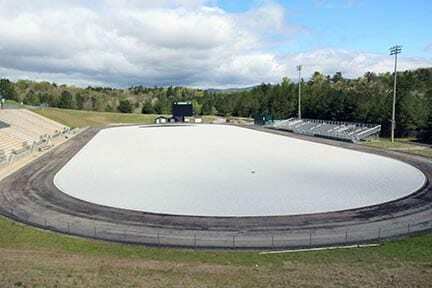 The first of many non athletic events that will take place on the new surface is scheduled for May 26, 2018 with the Graduating Class of 2018 receiving their diplomas and heading out in to the world. This weeks Star is #12 Marcus Byrd. 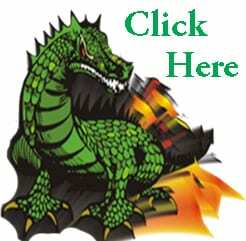 Byrd threw 5-10 for 38 yds and 2-tds in last weeks loss at NW Whitfield. He also managed to compile 120 yards rushing on 13 carries. Congratulations Marcus on being named Week 5 FYN Player of the Week.